1. Get handful of carrots, clean them, peel them if you can stand up long enough to do so. 2. Chop up cleaned carrots put in saucepan full of water. Put saucepan on stove top, cook until the carrots are completely boiled and soft to the fork test. 3. Drain water out of carrots into a soup bowl. Drink carrot water. 4. Feel slightly better than before. I did make this broth twice before moving on to the big bad bullion broth, but chose not to peel carrots cause it seemed like a waste of standing up time. Apparently I bought carrots twice with no intention of using them for anything specific. I, like I often do when I see it’s time to start cleaning out the fridge again, did some searching around for recipes that included a decent amount of carrots and celery and anything (or everything) else that I had on hand. I found something which looked good enough to tweak to my liking. I’ve made it twice since I found it, and it’s good for reheating for lunch (if you have the ability to reheat things at work) we’ve had it once with a side of andouille sausage (Leidy’s is my new favorite brand which is good and spicy and TOTALLY IMPOSSIBLE to find on any store shelf now that I’m looking…) and then the next time with some steak tips. Step 1: In a large skillet, heat butter and oil, until foam subsides, then add orzo and cook until golden brown, or “toast” the orzo until it’s a nice brown color. Make sure to stay near the stove and make sure the orzo doesn’t get a chance to get too hot – stir constantly. Step 2: Add carrots, celery, garlic, onion, pepper and salt – cook until onion is cooked, and lightly browned. Add the rice and saute, stirring constantly until all of the rice is completely covered din oil and butter. 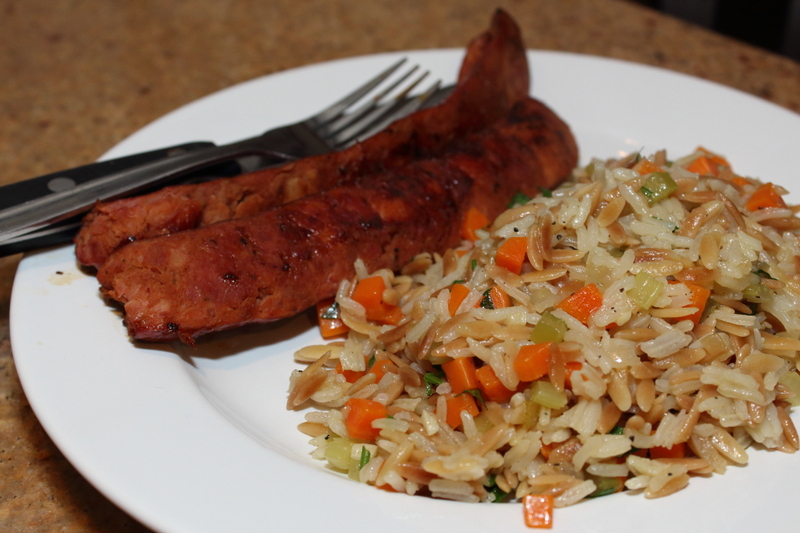 Now is a good time for you to start cooking your sausage side, or whatever else might take about 20 minutes to make that you’ll want to eat with this pilaf. Step 3: Add in the broth and water and bring the contents of your skillet just to a boil, and then reduce the heat to low. Continue to cook until the liquid is completely absorbed, this should take approximately 15 minutes. Remove from heat and add the parsley.